We were unprepared for this May rocket launch weekend. Toni and I were up late into the evening preparing a couple of rockets to send high into the skies. We departed early in the morning, made a brief stop at 7/11 for some java, and headed to the Central Sod Farm on Maryland’s Eastern Shore. We manage to cross the bridge just ahead of the Dover NASCAR traffic. 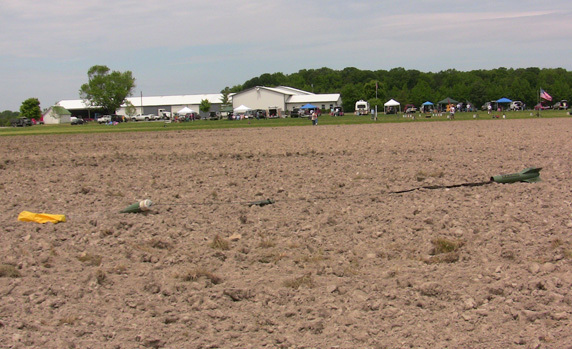 The weather at the sod farm was mild with intermittent blue skies, clouds, and low winds. 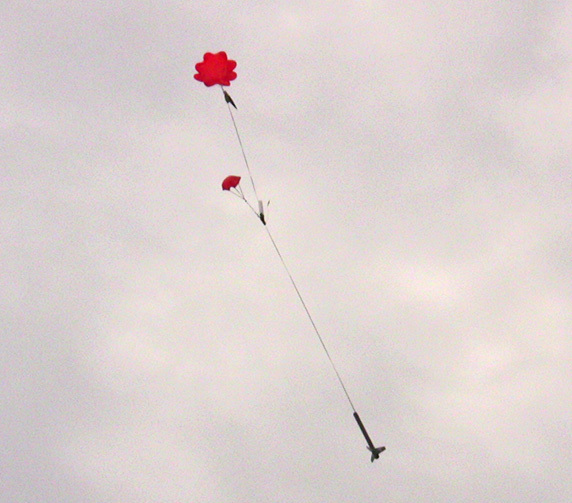 It was a very nice day to fly some rockets. 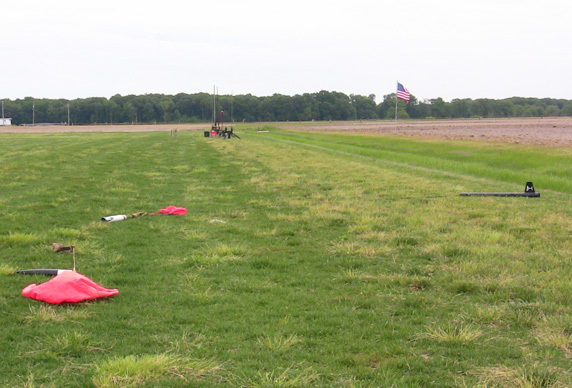 We completed some minor field setup preparations and set back to watch some early flyers so we could judge the upper and lower wind conditions. Misjudging the wind conditions at the sod farm results in a rocket sacrifice to the tree gods. Such a lofty landing will put a rocket out of commission until the tree gods decide to give it up or a well paid tree trimmer retrieves it. Some lucky flyers only had to wait a couple of years before recovering from one of these landings, but for the most part, the treed rockets will slowly be devoured by the elements over time. With an idea on how the winds were blowing, I started my preparations of the newly repaired Shaken, Not Stirred. Shaken, Not Stirred suffered slight zipper damage from Red Glare VIII. This would be Shaken, Not Stirred’s 25th flight and I hope for many more flights after this. After checking everything twice, I took the rocket to the pad, armed the electronics, and connected the igniter. The fact that Shaken, Not Stirred had already survived 24 flights meant I must have been doing something right. I took the launch card to the Launch Control Officer (LCO) and waited for the final countdown. Previously I had discussed with the LCO his subliminal ratings of each rocket that he launches with the words “nice” and “very nice”. This was to be no different. At the conclusion of the countdown, Shaken, Not Stirred leapt from the pad on a perfect trajectory. Apogee was achieved at 1,252 feet where the drogue was deployed. The backup charge fired close behind and Shaken, Not Stirred descended until the mains were successfully deployed at 400 feet. Shaken, Not Stirred touched down close to the pads to end its perfect 25th flight. Enjoy its 25th flight here and count the ratings. I counted 8 “nice” and 4 “very nice”. Was the LCO making fun of me? While I was retrieving Shaken, Not Stirred, Toni was busy preparing her rocket, Sally Ride. 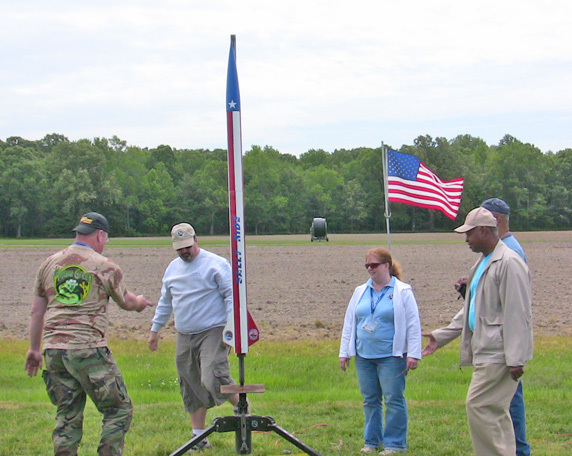 Toni chose a Loki J528 and soon had the rocket on the pad. The breeze had picked up slightly but the countdown continued. When it reached zero, Sally Ride quickly ascended on a plume of white smoke until arcing over at an even 1,500 feet. The drogue deployed and Sally Ride descended until the main parachute was ejected at 700 feet. Sally Ride majestically floated down under her large patriotic main parachute until touching down at the field’s edge. Toni had a perfect flight but she did not receive as many “very nice”s as Shaken, Not Stirred. See Sally Ride fly and recover here. Next on the pad was my original Level 1 rocket, R2/V2. A G80 motor was assembled and installed into the aft end. The G80 motor is the perfect motor for the sod farm. 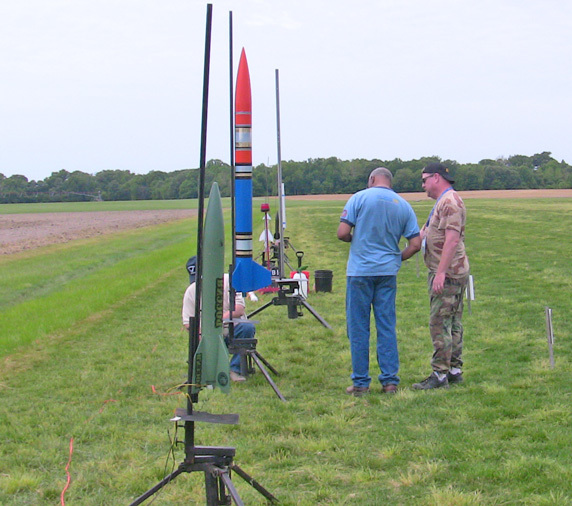 The G80 can send smaller rockets out of sight but it only sends R2/V2 to about 800 feet, which is perfect for a nice “low and slow” flight at the sod farm. R2/V2 arced over at apogee where the yellow main parachute was ejected and deployed. R2/V2 slowly descended and landed in the dusty plowed field without damage. Enjoy R2/V2’s return to the sod farm here. Our goal was to fly three rockets and recover them without damage. With our mission accomplished, Toni and I unpacked our picnic lunch and enjoyed some roast beef sandwiches washed down with some refreshing Propel water. We putzed around cleaning motors, RSOing, filming other flights, and lending a hand to anyone that needed it. After the last flight, we packed up the field and gathered around the flight line. It was a beautiful evening and no one wanted to go home. Finally fears of the Dover NASCAR traffic forced us to slowly trickle away from the flying field and start our journeys home. There was considerable traffic on the way home but there were no backups. Soon we were back on the Maryland’s Western Shore and at the last minute we hung a left towards Old Stein Inn. We were lucky enough to get a table in the Biergarten where we washed the taste of spent rocket fuel from our mouths with authentic Bavarian beer while enjoying a delicious German dinner. It was a great end to a great day of flying rockets. 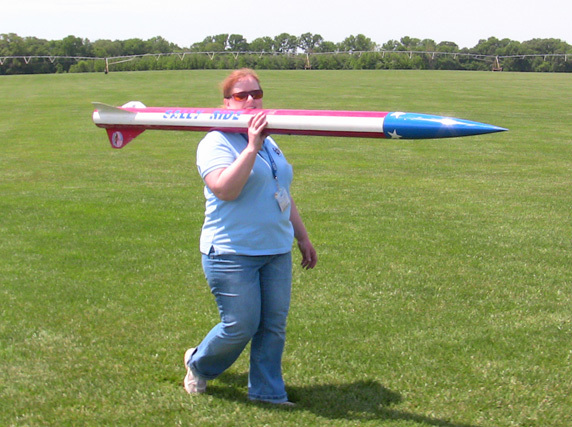 Toni committed herself to completing her new rocket project before the sod farm season comes to an end. We arrived home at 09:30 PM, tanner from when we left, and with no regrets. Enjoy some more of the day’s flights here. Until next launch . . .